The Conan comic books definitive issue-by-issue collecting guide and trade reading order for omnibus, hardcover, and trade paperback collections. Find every issue and appearance! A part of Crushing Krisis’s Crushing Comics. Last updated November 2018 with titles scheduled for release through July 2019. Conan has lived many lives in comics, from a young barbarian to a grizzled old king. Those lives are split into two distinct periods of Conan comics with distinctly different story continuity. His first life in comics was at Marvel from 1970 through 2000, largely under the pen of veteran Roy Thomas in his long-running series Conan the Barbarian. 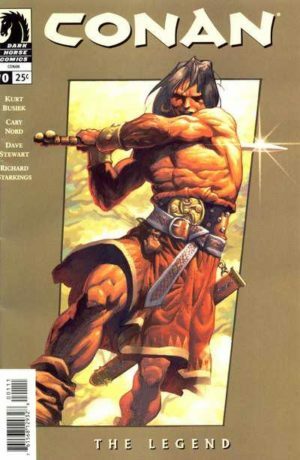 Then, in 2003, Conan comics made the jump to Dark Horse – initially under the pen of Kurt Busiek. Dark Horse launched his book with reverence, assuring fans that they would present adaptations of Robert E. Howard’s original work and its implied connective tissue – nothing more. In a major twist, Marvel won the license back starting in January of 2019! That means Marvel is able to release new Conan titles, reprints of their original Conan comics, and reprints of Dark Horse’s 15 years of Conan! The contents of Marvel’s original run from 1970 to 2000 are listed as an alphabetical index by title, since they published many series outside of the spine of Barbarian and King Conan. However, the content of the page is chronological by series. Dark Horse’s contents are listed and presented chronologically in the order the series have been released. Conan: Sons of Bel (2007) – One-Shot reprinting #34. 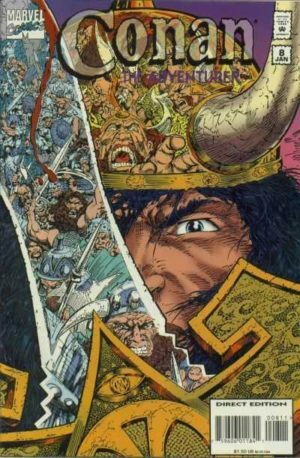 A run of King Conan mini-series directly adapt Robert Howard stories followed the aging ruler through a multi-story arc that is not in continuity to the series above. Launched by Jason Aaron and Mahmud Asrar. 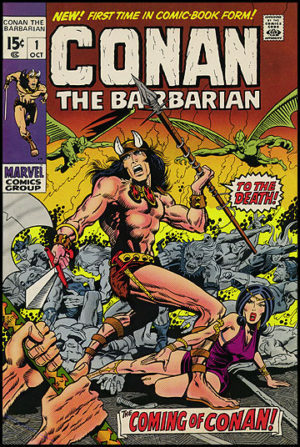 Conan the Barbarian has been reprinted in many fashions over the past nearly fifty years, but it has been primarily collected in just three lines – only one of which is complete. 1. 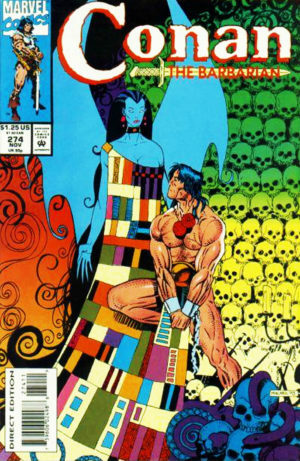 The Barry Windsor-Smith Conan Archives (2010) collects all of the BWS issues from #1-23. It features the same modern, digital recoloring as the Chronicles series. 3. Marvel’s 2019 omnibus line, which restores the series to original colors. 4. The Chronicles of Conan reprints the entire series in 34 paperback volumes as detailed below! Note that the early volumes of this series have been digitally recolored with modern techniques. Many fans find this objectionable, and thus prefer the volumes above for the classic. BWS material. Note: Volume 3 of the collections of the 2003 Dark Horse series also bears the title “Tower of the Elephant.” I have physically checked a copy of Chronicles Vol. 1 to confirm the ISBN so you don’t wind up with the wrong book! Please take care in ordering it from resellers – have them confirm the ISBN! Issue #64 is omitted – it reprints Savage Tales (1971) #5. Issues #66-68 cross over to Marvel Feature: Red Sonja #7; Red Sonja was not covered by Conan’s reprint license at the time Vol. 9 was published, so the issues are not included in this reprint. Annual 3 (1977) reprints The Savage Sword of Conan (1974) #2-3; it’s original story is Kull rather than Conan. Issue #94 is omitted , but I’m not sure why! Note that after Annual 12 Conan’s large yearly stories move into OGNs, listed below. This series was rebooted as Conan the Adventurer (1994), below. However, the chronological story of Conan continued into Savage Sword of Conan backups beginning with issue #218. Collects Savage Tales (1971) #1-5; Savage Sword Of Conan (1974) #1-12 and Special (1975) #1, complete with articles and letters pages. #2-3: Also collected in The Barry Windsor-Smith Conan Archives (2010) Vol. 2 hardcover and artwork in Conan Original Art Archives (2013) Vol. 1 hardcover. This 2019 Marvel omnibus series includes the full contents of each issue, complete with articles and letters columns. 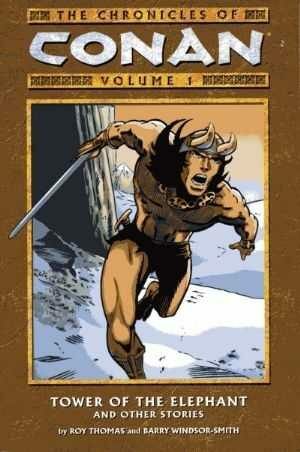 This 2007 reprint from Dark Horse collects only the Conan stories from this magazine-style anthology series. This series was rebooted as Conan the Savage (1995), below. Though not strictly Marvel material, Conan’s newspaper strips were penned by many Marvel bullpen authors like Roy Thomas and Doug Moench. #1-14: Not collected (although, with Chronicles of Conan reaching the end of Conan the Barbarian in 2017, this could conceivably be next). Continues from Conan the Adventurer as written by famed G.I. Joe and Wolverine scribe Larry Hama. A rebooted Savage Sword of Conan. 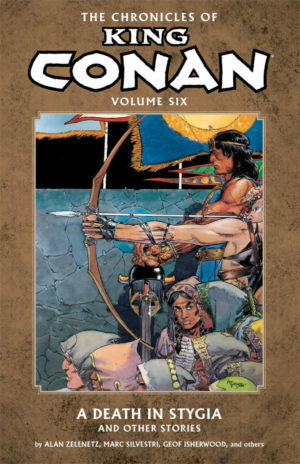 Conan was re-launched into new sequence of connected mini-series, though they did not have Roy Thomas’s pedigree as author. These have not been collected as of the most recent update of this guide. Giant-Size Conan (1974) #1-5: Not collected. Issues #1-4 are an adaptation of Hour of the Dragon, which continues into Savage Sword of Conan #8. Issue #5 is all reprint material. Conan the Barbarian Movie Special (1982) – A movie adaptation. Not collected. Conan the Destroyer (1985) – A two issue movie adaptation. Not collected. 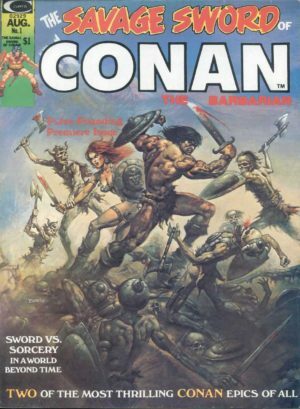 Conan Saga (May 1987 – April 1995) #1-97: A reprint series of various Marvel Conan titles. Conan vs. Rune (1995) (Marvel) – A crossover with Winsor-Smith’s Malibu title. Continues to Conan the Cimmerian (2008), below. Content from issue #0 has been broken across several collections, as listed below. Excerpts from these series were reprinted as Conan: The Frazetta Cover Series (2007) sporadically from 2007 to 2011. Collects #0-15, 23, 32, 45-46. Effectively a recollection of Volumes 0-2, including all of the scattered Vol. 0 material. Collects #16-17, 19-22, 24-25, 29-31, 33-34, 37-38, 41-44. Effectively a recollection of Volumes 3-5. Effectively the “Conan Omnibus Companion” to pick up the issues other Omnibuses skipped, this collects Conan and the Jewels of Gwahlur, Conan: Book of Thoth, Conan and the People of the Black Circle, Conan and the Songs of the Dead, Conan: The Blood-Stained Crown and Other Stories, and Conan: The Daughters of Midora and Other Stories. Conan and the Daughters of Midora (2004) One-Shot was released at the same time as #9 but is not in continuity with these stories; collected below in 2010 as Conan: The Daughters of Midora and Other Stories. Collects #16-17 & 19-22 and material from #0 (#18 is a single story collected in Blood-Stained Crown). Note that this shares a title with the first volume of the Chronicles of Conan series – please take care to confirm the ISBN before purchasing. Released starting at #21. I don’t know if this is in continuity. Released with #28. Collected with “The Spear,” below. Released starting at #35. 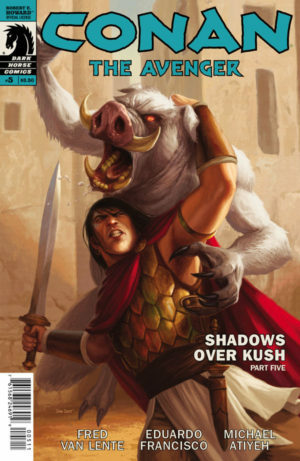 Also collects Conan Funcom Special (2006), a one-shot to support the eponymous video game. Art retrospective. Published by Image. Continues to Conan: Road of Kings (2010) #1 , below. Collects the full series from issues #0-25. Collects Conan the Cimmerian (2008) #14 & 16-25, Conan: Road of Kings (2010) #1-6, Conan: The Weight of the Crown (2010) one-shot, and MySpace Dark Horse Presents (2007) #28-29. Effectively a recollection of Volumes 9-11. Collects #0-7. I personally verified the hardcover ISBN from photographs – if the book has this IBSN, it’s the right one. Release alongside #17 and collected in Iron Shadows in the Moon, directly below. Collects #22-25. 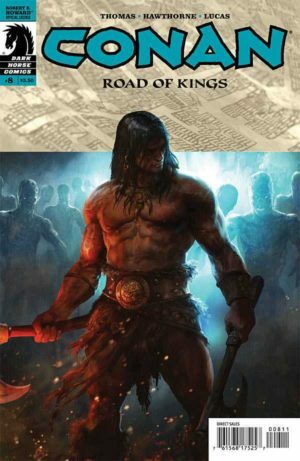 The HC collects Conan: The Weight of the Crown (2010) one-shot, but the paperback may not. Continues to Conan the Barbarian (2012) #1, below. Released between #6-7. Film tie-in. Not collected. Continues to Conan the Avenger (2014) #1, below. Unconfirmed as of this writing, but seems to be effectively a collection of Volumes 15-16, “Phantoms of the Black Coast,” and possibly also Volume 17. Continues to Conan the Slayer (2016) #1, below. Based on the listed contents, this definitely collects Volumes 19-20! It likely also collects Volume 18, though there’s some question as to whether Volume 17 is in the prior volume or this one. Released starting at #17 by Dynamite, who are the rights-holders for Red Sonja. Here the numbering of these trades is finally reset! The Colossal King Conan (2018 oversize hardcover) – Collects all 24 of the issues below.